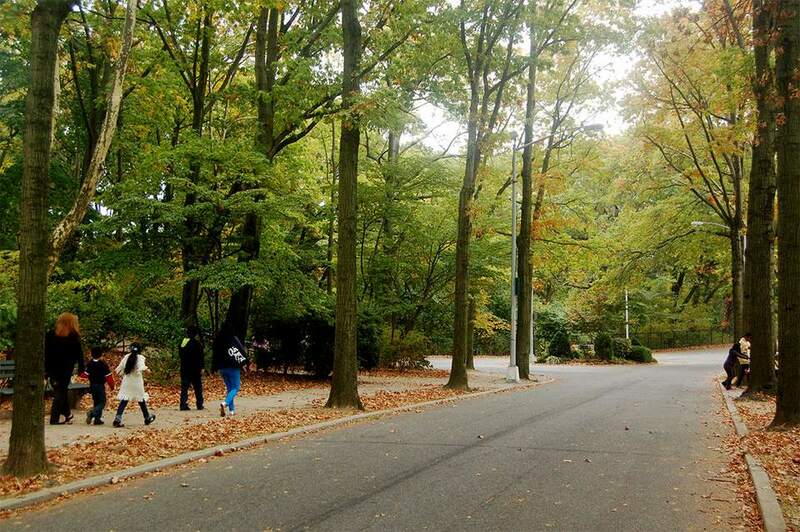 Forest Park, 538 acres of trees and fields, is a jewel of a park in Queens, New York, bordering the neighborhoods of Richmond Hill, Kew Gardens, Forest Hills, Glendale, and Woodhaven. Designed by the legendary landscape architect Frederick Law Olmsted in the 1890s, Forest Park is the third largest park in Queens. On its eastern side, enjoy strolling in thick woods plus trails for running, biking, skating, and horseback riding. On its west, find golfing, a merry-go-round carousel, bandshell concerts, and playing fields. Daniel C. Mueller Carousel: Wooden carousel for children. Though historic (1903), it's dark with metal bars on its perimeter. Golf: An 18-hole golf course is on the park's far western perimeter. A par 70 golf course. Reserve tee times online or call 718-296-0999. Forest Park Drive: Two miles of tree-lined Forest Park Drive between Woodhaven Boulevard and Metropolitan Avenue is closed to cars and perfect for strolling, biking, and skating. Hiking: There are three nature trails, .5 to 1.75 miles. Mountain Biking: Off-road bikers use the nature trails. Horseback Riding: Hire horses at two private stables for 7 miles of bridle paths. The Jackie Robinson Parkway crosses Forest Park. Other major roads are Myrtle Avenue, Woodhaven Boulevard, Union Turnpike and Metropolitan Avenue. Eastern side/woods: Jackie Robinson exit 6 to Metropolitan Avenue toward Kew Gardens -- park by Park Lane South. Or park near Myrtle Avenue in Richmond Hill. Liberty Field/Carousel: Jackie Robinson exit 5 to right on Myrtle to right on Woodhaven and park. Golf course: Jackie Robinson exit 4 to left on Forest Drive to left at light to the parking lot. Subway: From the J and Z subways' 85 Street/Forest Parkway, Woodhaven Boulevard, and 104-102 Streets stations, walk north a few blocks. From the E and F subways' Union Turnpike station, walk west on 80th Road. Train: From the Long Island Rail Road at Kew Gardens, follow 83rd Avenue, turn right on Metropolitan Avenue and continue for a few blocks. Bus: Q11, Q23, Q37, Q53, Q54, and Q55. Maps: MTA's subway and bus maps. The George Seuffert Sr. Bandshell has hosted concerts since 1905. It can hold up to 3,500 people. During the summer the Queens Symphony Orchestra plays free Sunday afternoon concerts in the bandshell. On Wednesdays throughout the summer, concerts, puppet shows, and other performances are held. Long before it was Forest Park, the area was home to Rockaway, Lenape and Delaware Native Americans. In the 1800s it was mostly woods until the Brooklyn Parks Department bought the land in the 1890s and called it Brooklyn Forest Park. Olmsted designed Forest Park's main drive on the eastern side of the park. The golf course and athletic facilities were new in the 20th century. Since the 1990s the park has undergone an overall revitalization. Forest Park is on the edge of the Harbor Hill Moraine, from the glacier that molded Long Island 20,000 years ago. The park's terrain is "knob and kettle," a mix of ridges and irregular gullies. Forest Park Preserve has 165 acres of trees, the largest continuous oak forest in Queens, plus hickory, pine, and dogwoods. Birding in the woods is best in the fall and spring, when cerulean and yellow-throated warblers can be seen. Hawks and herons visit the restored Strack Pond.